By far the biggest maintenance project that we have undertaken this year is related to the large amount of exterior teak that we have on board. 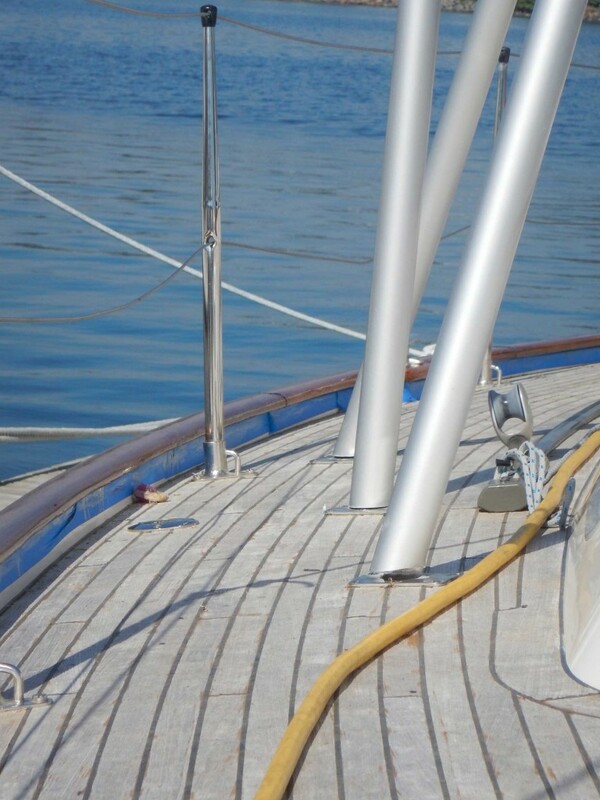 Teak has some great properties for long term durability in the marine environment and teak decks have been used for years as they offer superior traction while working on deck at sea. Despite this, many cruising sailors are in agreement when it comes to buying their second cruising boat that they want a minimum amount or even no teak on their next boat. We are certainly on the road to knowing why. 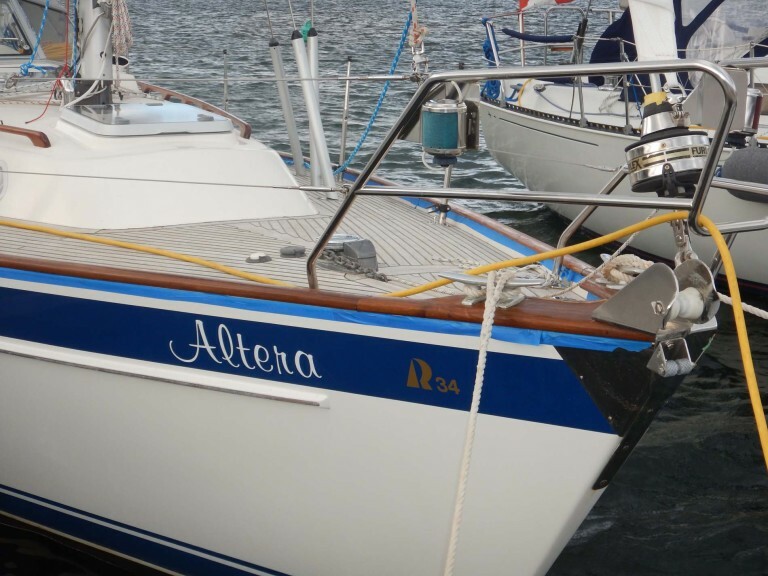 When we purchased Altera the hand holds and the toe rail around the edge of the deck were all varnished and looked sharp. The problem was, that the undersides where is extremely difficult to ensure a reliable finish as it is difficult to sand and and ensure that it is fully coated. Even laying your head on the deck there are parts you just can’t see. So, while the top looked great, it was slowly peeling outwards from the underside. As the adhesion of the varnish failed, it trapped moisture so the undersides were starting to build and trap mildew. Eventually it would need to be completely refinished. Last summer, Chrissy did a lot of reading and came to the conclusion that the best way was to strip it and start fresh. Unfortunately the time it would take was underestimated. So the plan had been to strip it, sand it and let it dry out to ensure the mildew was gone and then revarnish. Unfortunately, the revarnish stage didn’t get completed before we left, partly due to timing and partly because the intense UV in the tropics really beats up on the varnish and we didn’t want to go through the stripping process again. Ever. Well, teak being a wood with soft and hard grains, can erode at the soft grains. Driving rains, scrubbing and presumably even rough seas probably all contribute to eroding the soft grain. So our toe rail and hand rails were eroding, and while I could live with the grey colour, the erosion was bother me. 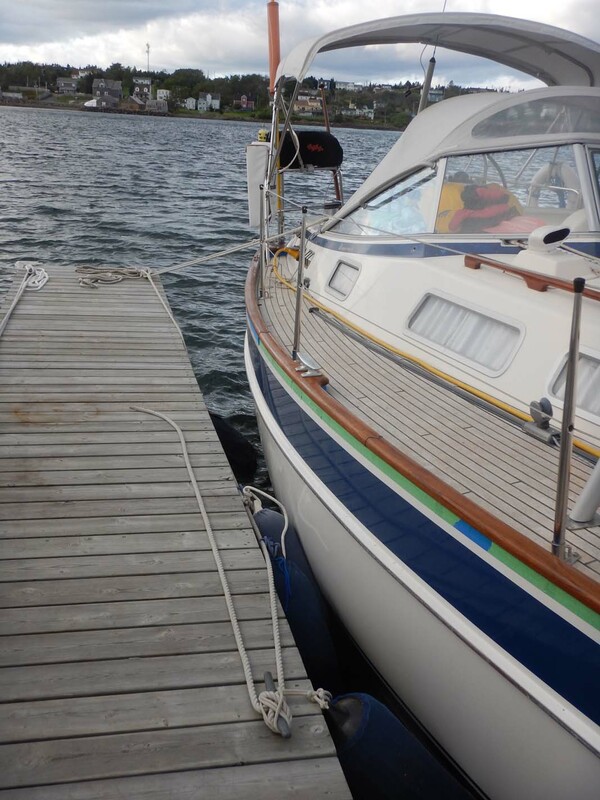 When we arrived back in Arichat a couple of weeks ago, we had clear weather and Chrissy was off to help with wedding plans with her friend, so I figured I would take a shot at the hand rails, a little interior varnish around the galley sink where it was wearing and the companionway. It took a full day of sanding the handrails to get them ready, a lot longer than I had bargained for but as you can see they look sharp again after 5 coats of Epifanes teak finish. This is supposed to be the best product available for marine teak. 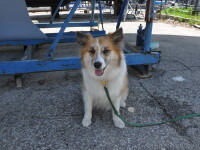 Around the companionway sees a lot wear as we are always in and out and often brush against part of it. 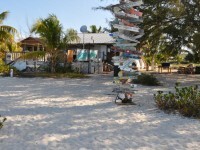 The outermost strip is frequently not finished and to be honest I’m not really clear on why. Because it was not finished, age was starting to get the better of it and at a few edges the wood was splitting. I cleaned it all up, glued a couple of the split grains back in place, sanded it finished it so now it should last indefinitely as long as we annually sand the top layer of varnish and add a couple new layers. You can see below where the varnish stopped previously. On deck, Altera has close to 1500 linear feet of caulking. 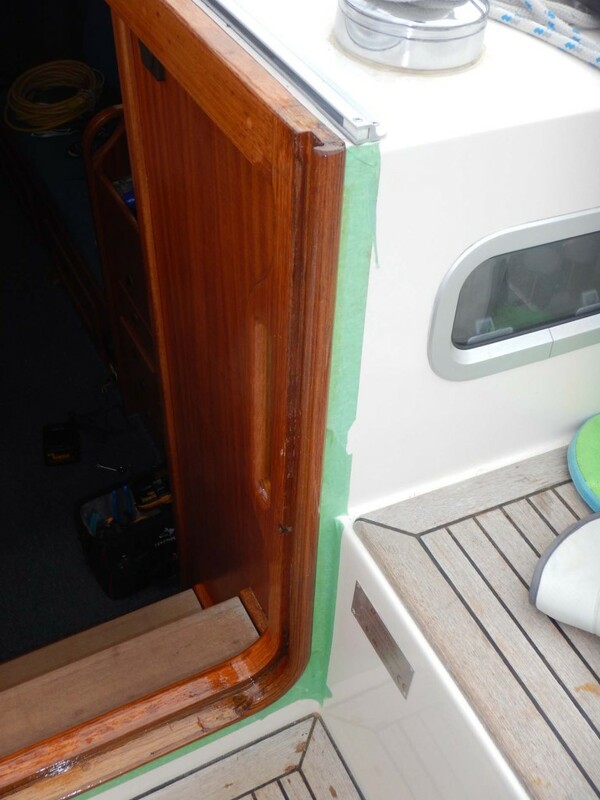 As the caulk ages it expands and of course to some extent the teak wears away. This leaves the caulking sitting proud of the decks. We determined this summer that it was at the point where we should trim down flush, otherwise when we are on deck bracing ourselves we would run the risk of pulling it loose. 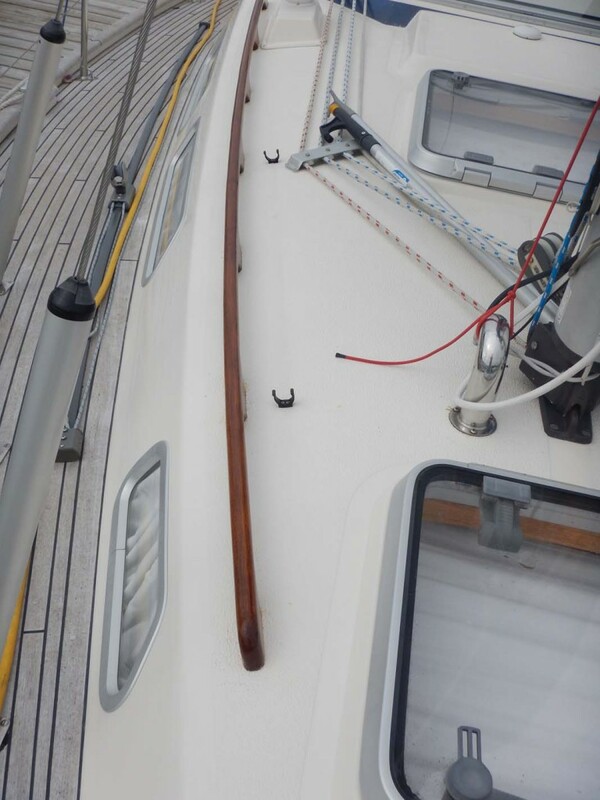 Plus, with teak you always have to swab the decks perpendicular to the grain which was getting to be near impossible as the sponge would just trap grit or slime at the caulking seams. I’ve spent more than a few hours on my knees carefully pushing a wood chisel along the seams to clean up the caulk. On the bright side, in the process I’ve only found about 3 feet of caulking that needs to be replaced. The wood chisel gives a decent finish, but there are a few spots that need a bit of touch up. I tested the process in the cockpit earlier in the summer and the rough spots look like over the course of a year or so will wear in naturally. In the meantime I need to decide if I will just leave it or follow the advice of others that have done it and sand it gently instead to get the clean finish sooner. The smooth surface now feels really nice to walk on and I suspect I’ll swab the decks more often to keep them clean and salted (which helps preserve them) as the sponge wont keep hanging up on the caulk. 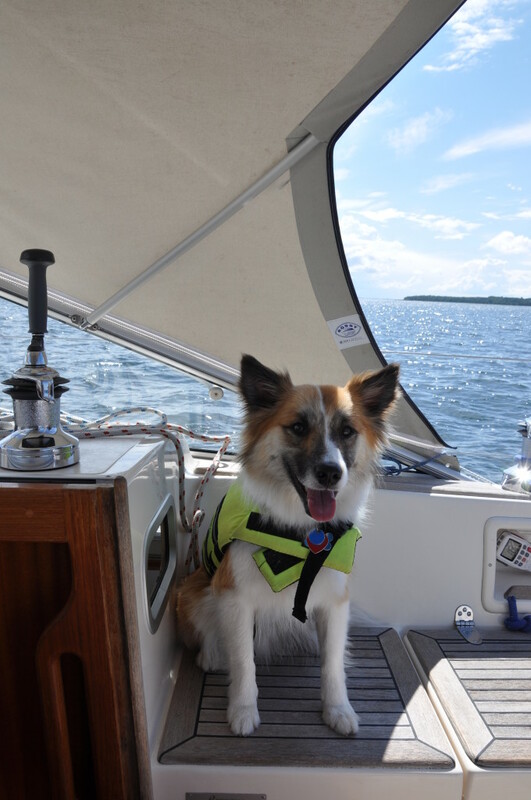 This past week, we made a last minute decision based on a favourable warm, sunny weather window to get around to refinishing the toe rail and at the same time the flag pole and outboard motor mount. Here you can see the first coat of Epifanes wood finish applied after a solid 2 days of sanding and prep. 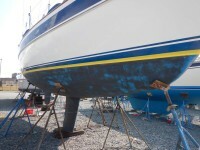 We will get 3 more coats on this week before we set off, but will have to lightly sand it and apply 2 or 3 more coats while in the Cheasapeake Bay next month so that it is ready for the intense UV light down south. Ideally we will have 5 layers on top of the first layer which has to be applied with a thinner to help it soak into the wood and adhere properly. I also thinned the second layer just to be sure. To make sure Altera stayed in place I had to get creative with the docklines and fenders so that the newly applied varnish wouldn’t be rubbed off. You can see my spring line looped around the primary winch and all my fenders tied to the dock instead of the boat. Not ideal, but for the mild winds we have in the forecast it has been working just fine. I will admit, that while the sanding and prep was a real nuissance, it is very satisfying applying each new layer of varnish and taking a step back to look at the results. Will I ever buy a boat with exterior teak again? To be honest, I’m undecided. I do like the look of the finished toe rail as an accent, but I certainly wouldn’t want more. As for the decks, we will see how they continue to stand up over time. The caulking thing has been a once in 17 years item and I do like the feel underfoot. Looks great – I have stripped, sanded, and varnished all the teak on my 23 a couple of times and have decided on replacing it all with the simulated stuff after seeing how natural it looked on the new Beneteaus. I’m hoping I have more than a few good years left in the decks… As for the rest, when it comes time to replace… plastic teak sounds good. Teak looks lovely, but the thought of all the work kind of puts me off. You’ve done a great job with yours! Everything is looking great!! You guys have done a fantastic job. Gotta say though, I think my golf clubs are easier to maintain!! LMAO. You might be on to something, although you can’t live in your golf bag! We had a Tayana 37 once – but no teak deck – so do know the work involved and why our current Catalina is teak-free except for the companion way door and cockpit table. But now the finished product puts a smile on my face now every time I walk up to the boat. As for diet, we eat very well. Arguably healthier now than we did on land as we did cut down a bit on meat. You’ll have to convince Chrissy to put a post on this subject as she enjoys finding local foods to create meals with where I tend to stick to the tried and true when I cook. Hm, Jeff…. I have to convinceChrissy? You think I will be more successful than you? I shall try by mailing her at Sailnet!